Home CDN , children , crafts , feature , holiday , holidays , homeschool , January , papercrafts , printables , US , worldwide January 11th - Featuring Amelia Earhart Freebies! January 11th - Featuring Amelia Earhart Freebies! -- Based on a decade of archival research through Earhart's letters, journals, and diaries, and drawing on interviews with the aviator's friends and relatives, East to the Dawn provides the most authoritative and richly textured account of both Earhart's record-setting aviation career and her personal life: her early years with her grandparents, her experiences as a nurse and social worker, her famous marriage to publisher George Putnam, and her secret affair with Gene Vidal, head of the Bureau of Air Commerce. 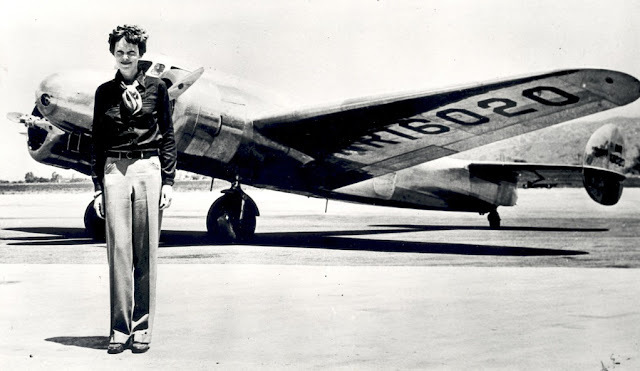 • Amelia Earhart: The Truth at Last -- Nearly everything the American public has seen, read and heard in the media for nearly eighty years about the so-called Amelia Earhart mystery is intentionally false or inadvertently misleading. The widely accepted myth that the disappearance of Amelia Earhart and Fred Noonan during their ill-fated world-flight attempt in July 1937 is among the greatest aviation mysteries of the 20th century is an abject lie, the result of decades of government propaganda continuing unabated to this day. • Aviator Pilot Cap -- Aviator cap brown with buckle adult size. Made of brown faux leather with a vintage look. This novelty costume hat is great for kids and adults with smaller head sizes. Great for costumes, dress-up, role-playing, and school projects! - A wonderful opportunity to identify and reveal things for which you're grateful, and express them with simple acts of thanks. Are you overdue in expressing thanks to your family, pets, friends, co-workers, neighbors, the mail carrier, or the Universe (God or whatever you like to call him or her)? If so, now is the perfect time to put thank you out there. - A hot toddy is a name given to a mixed drink served hot, believed to have originated in the 18th century to make the taste of scotch more palatable to women. Traditionally drunk before going to bed, or in wet and cold weather and in the past they were believed to help cure a cold and the flu. - A fun way to remind each other how special we are! Being someone's Secret Pal doesn't have to be expensive -- in fact, like most things in life, simple is best. - A day just for mischievous fun. After all, any kid knows to splash and jump into puddles is fun. And, when that results in splashing a friend, your joy is complete. - This day was chosen because, reputedly, milk was delivered in glass bottles for the first time in 1878 on this day. Glass bottles allowed milk to be delivered in sanitary conditions to customers. Before this, it was brought round in large milk cans, often open to the elements. You would bring your pail and they would ladle out how much you wanted. - US Surgeon General Luther Terry issued the first government report on Smoking and Health, on January 11, 1964, saying smoking may be hazardous to one's health. - In 1770, John Bartram of Philadelphia, Pennsylvania, received the first shipment of rhubarb sent to the United States. Bartram is the first documented to grow rhubarb in North America.